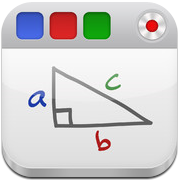 Educreations is a whiteboard, screencasting app. It is open-ended and multi-purposed - it can be utilized by all users, in all subject areas and in all grades! It's free and is included on all WRDSB iPads! Here is some basic information to get you started . . . When you open Educreations, you will notice across the top that there are coloured draw tools and if you press and hold on the one that has a down arrow, a wider variety of colours will appear. The finger is a select tool, the 'T' is a text tool, the arrows will either 'undo' or 'redo' and the eraser will erase lines but not text or objects. The square frame that looks like a photo frame offers options for bringing in images - either directly from the camera, from your photos, from Dropbox or from the Web. When you bring in an image, you will see several editing tools at the bottom of the image with explanations for each. You can also pinch to shrink the image and move it around by dragging. The magic of Educreations is the 'RECORD' feature which happens by touching the 'rec' button in the top right corner. When you are recording, everything you SAY as well as all activity on the screen will be recorded and can be played back. This is an AMAZING way to have students share their learning and explain their thinking. When the screencast is complete, touch the 'Done' button and choose 'Save Lesson' or 'Start Over'. If you choose 'Save Lesson', a new window will open where you will be asked to give your project a Title and Description (optional). After doing this and selecting 'Next', you will then be asked to choose who can view this lesson. In the beginning, I recommend that you choose 'Private'. The next screen you may skip if you wish and simply choose 'Save'. The project will then be saved and you can choose it from the menu to watch and enjoy!